Anton Rooskens followed the technical school in Venlo from 1924-1934. After that he followed an apprenticeship by a maker of music instruments. In 1935 he settled in Amsterdam. As a painter he was an autodidact. In the thirties he painted mainly landscapes, influenced by the paintings of van Gogh. 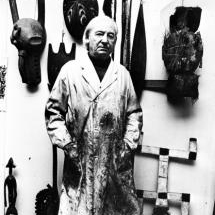 In 1945 Rooskens visited the exhibition ‘Kunst in Vrijheid’ (‘Art in freedom’) in the Rijksmuseum in Amsterdam. Here he first faced African sculptures. The simplified shapes and figures he saw here, inspired his work visibly in the years after the war. In these artworks you can also taste the influence of the early-20th-century avant-garde art movement Cubism. Since 1946 Rooskens frequently had contact with painters Appel, Corneille and Brands. In 1948 he met Constant. In this year, this group of artists founded The Experimental Group which later went up in the CoBrA movement. Rooskens created his own language of magical signs in black, yellow, ocher, blue and red. He painted compositions where masks and shields are tangled in coloured surfaces and lines. In 1954, for a short period, he painted in a geometric style under the influence of African art. Since the second half of the sixties, the imaginary creatures that remind us of the CoBrA movement became important in Rooskens’ paintings again. His paintings were lighter since that time till his death in 1976.